Green Room is called "Large double room" at booking.com. This is a big room, about 30 sqm, located roadside on the second floor. 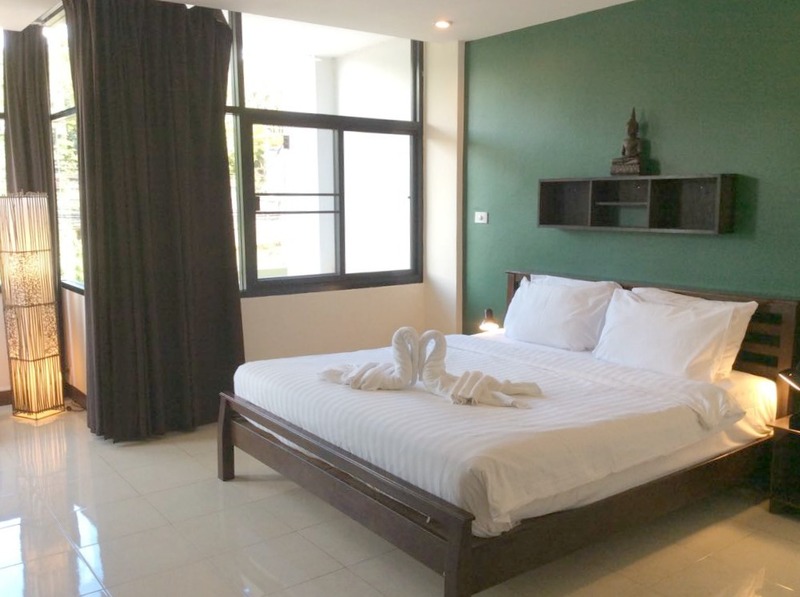 Green room is a spacious and comfortable accommodation. Big windows are facing the street and might let some noise in when the road is buisy, even if surprisingly few guests complains about it. Thick curtains keeps the morning sun out when it rises over the hills of Koh Lanta. The bathroom is small. The shower is placed very close to the toilet, almost OVER the toilet, as it is in many places in Thailand. Even though the bathroom is small, it still has everything in it as the bigger ones in Yellow, Blue and Orange room. This is the room with "the best spirit" at Cozy, according to our staff. Curious about Green room? Contact us and we can tell you more. Bright and big - Green room.